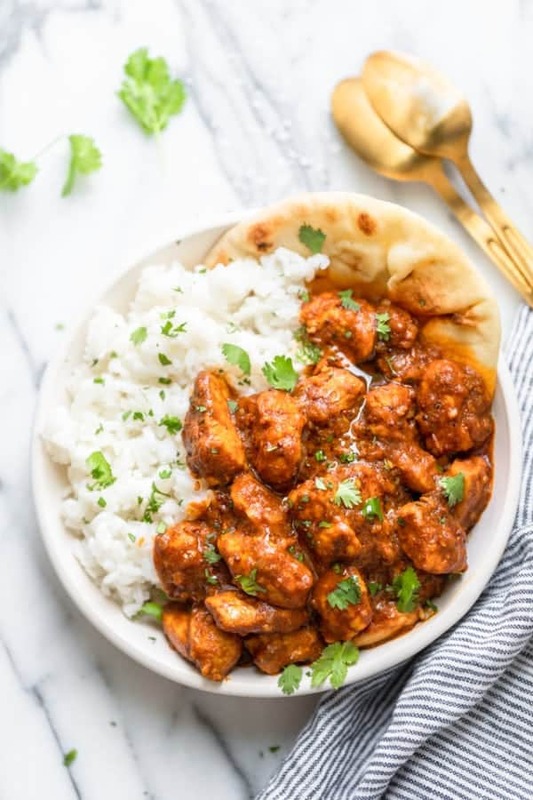 A simplified version of the popular Indian dish, this Easy Butter Chicken recipe has a creamy tomato sauce, all cooked in one pan in less than half an hour! Do you remember the first time you heard of butter chicken (which is known in India as Murgh Makhani)? I literally just pictured chicken swimming in butter… But then I actually tasted it at a restaurant. It was like a party in my mouth! Authentic butter chicken is a labor of love. It requires the chicken to be marinated in advance, has more authentic Indian spices than I can probably pronounce, and takes at least an hour to make. I only allot myself 30 minutes for most recipes. So I took a shortcut and made this [still absolutely amazingly tasting] easy butter chicken. Don’t be scared by the list of ingredients. 7 of them are just the spices and all the rest are simple easy-to-find items. 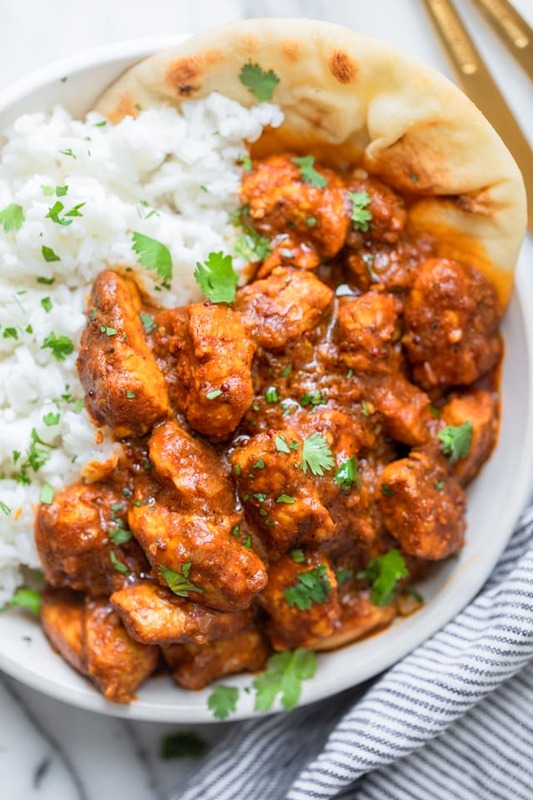 I promise you all the flavor of traditional butter chicken is still there (thanks to my amazing Indian spice collection!) And I promise you the chicken will come out juicy, tender and unbelievably tasty! Also, the best part is that even though it’s a butter chicken recipe, there’s really only 1 tablespoon of butter in the recipe. To start, cook the onions with the butter and olive oil. It’s a great idea to finely dice the onions if you can. This helps the onions blends in well with the sauce. When the onions soften, I add some grated ginger and minced garlic. You know by now this is all happening in one pan, right? That’s why it’s easy butter chicken. So into the pan goes literally everything else! There’s chicken breast, tomato paste, red curry paste and tons of colorful Indian spices. Once I add the coconut milk to that mixture, it transforms the dish to a beautiful orangey color that’s basically like a velvety butter bath bursting with flavor. Allow it simmer though for 20 minutes. You want the chicken to cook completely and the sauce to thicken. That, my friends, is the whole recipe. 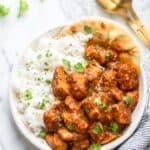 It’s the fast and convenient recipe for us butter chicken lovers that have 30 minutes to get dinner ready on the table. By the way, while that is simmering for 20 minutes, it’s the perfect time to make rice to go along with this meal. You can also serve it with naan, quinoa, or brown rice. But long grain white rice or basmati rice is the best. It’s the way it’s served traditionally. Be liberal with the spices. Like a lot of Indian recipes, this one is a heavily spiced dish. When you break down the ingredients, you’ll realize that all the flavor comes from the combination of warm smokey spices. Use my recipe below as a guide but feel free to add more and substitute the spices you don’t have with more of the ones you do have. Use fresh ginger and fresh garlic. 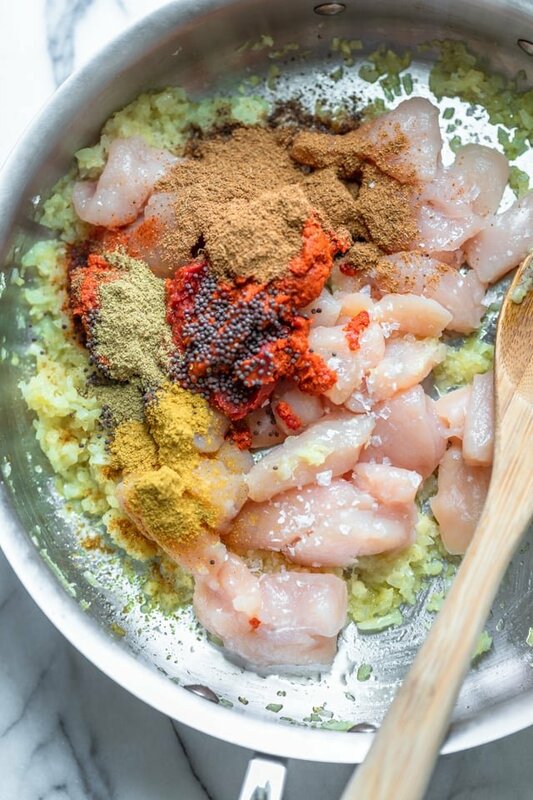 Yes, we are throwing in a ton of spices in the dish. And it’s tempting to throw in more dried spices like ginger and garlic. But it’s important that you use the fresh versions. They add a ton more flavor to the dish than their dry counterparts. Customize it with vegetables. 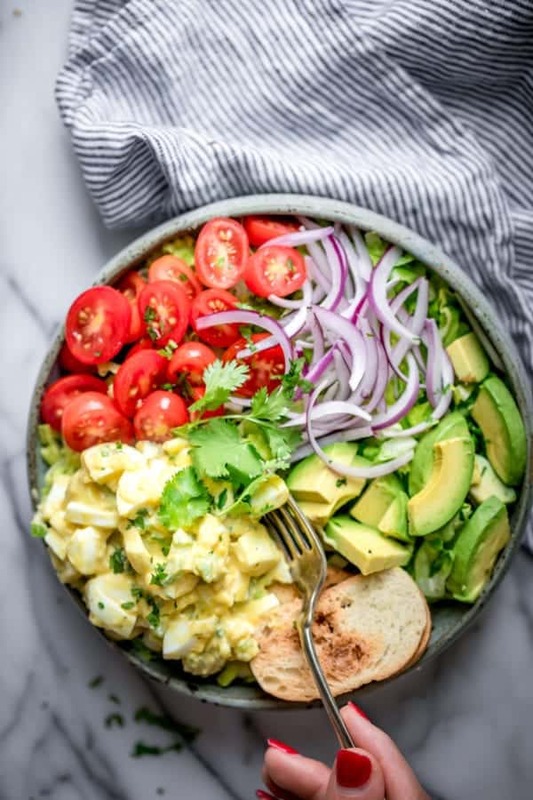 The chicken is the star of the dish, but you can certainly bulk this up with any other vegetables like carrots, cauliflower or peas to add more servings of vegetables. Substitute the butter if you prefer. 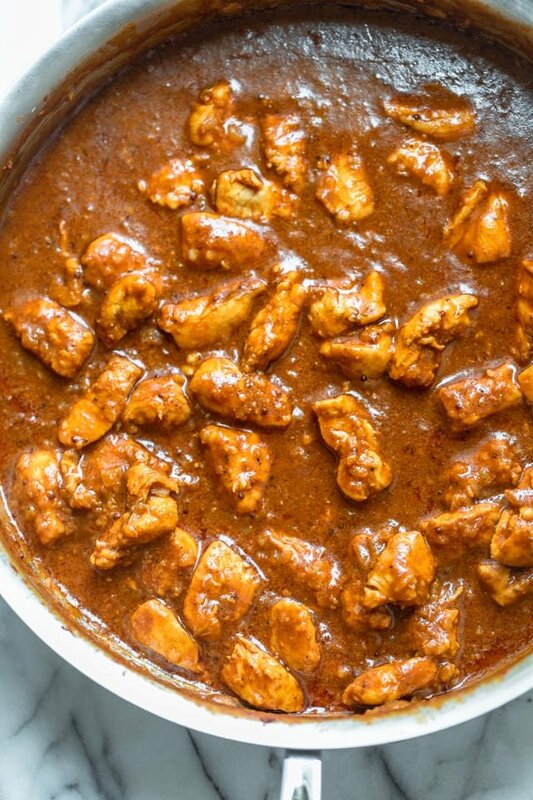 You don’t need butter to make butter chicken? Nope. This recipe gets all its richness and “buttery” taste from the from cream, or in my case, the coconut milk. 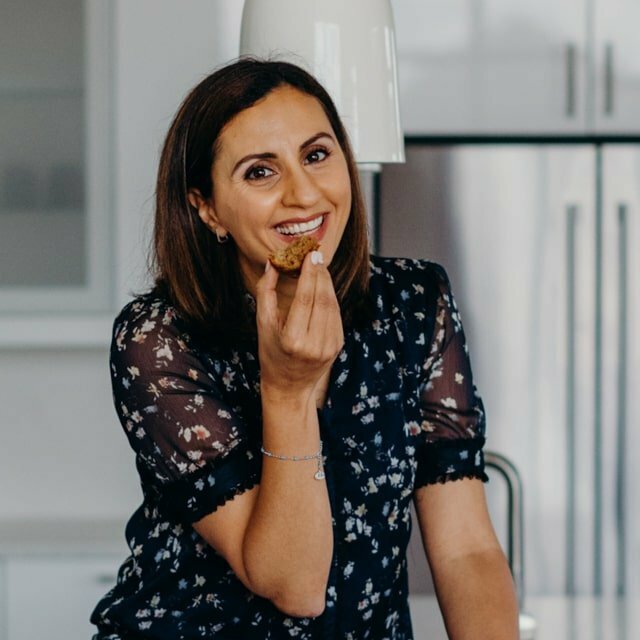 So if you’re not a fan of butter, try olive oil or any other cooking oil. If you’ve tried this healthy-ish feel good Easy Butter Chicken recipe or any other recipe on FeelGoodFoodie, then don’t forget to rate the recipe and leave me a comment below! I would love to hear about your experience making it. And if you snapped some shots of it, share it with me on Instagram so I can repost on my stories! 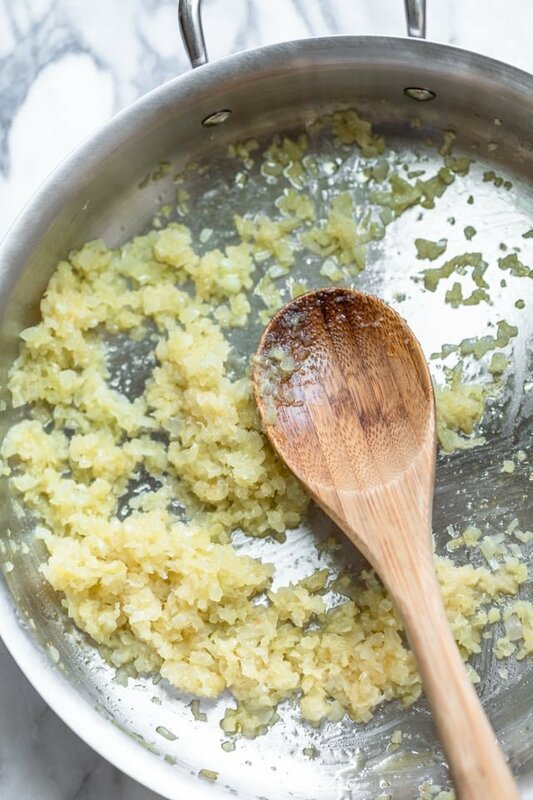 Heat the butter and olive oil in a large skillet over medium-high heat. Cook the onions until they become soft and translucent, about 3-5 minutes. Stir in the ginger and garlic and cook for an additional 1-2 minutes. Add the chicken breast to the skillet with the cooked onions. Add the tomato paste, red curry paste and the Indian spices to the chicken. Season with salt and pepper. Stir in the chicken until it's well coated with the onions, tomato and curry pastes and spices. Pour the coconut milk over the chicken mixture and stir to combine. Bring the mixture to a boil, and then set the heat to low, and simmer for 20 minutes. 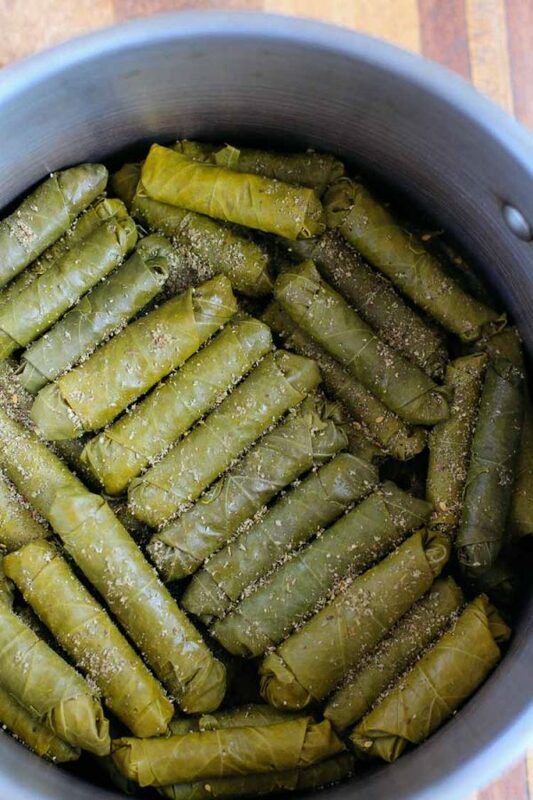 Make Ahead: If you want to prepare some of the dish ahead of time. You can saute the onions, garlic and ginger with the butter and olive oil. Then transfer the onion mixture to a bowl, add all the ingredients on top of it and stir to combine. You can do this up to one day in advance. When ready to cook, just put everything in a pan, bring to a boil, then simmer on low heat for 20 minutes. Sourcing: You can find most of the spices at major grocery stores. Garam masala may not be as widely available, but you can find at Indian specialty stores. Substitutes: For best results, follow the recipe as is. If you can't find garam masala, you can make your own blend. Here's are two popular substitutions: 1 part cumin plus 1/4 part allspice. Or any combination of: Coriander, Cumin, Black Peppercorns, Cardamom, Cloves, Nutmeg. Nutrition Label: Please note the nutrition label does not include the rice or naan. Is there anything I can substitute red curry paste with if I cant get it? 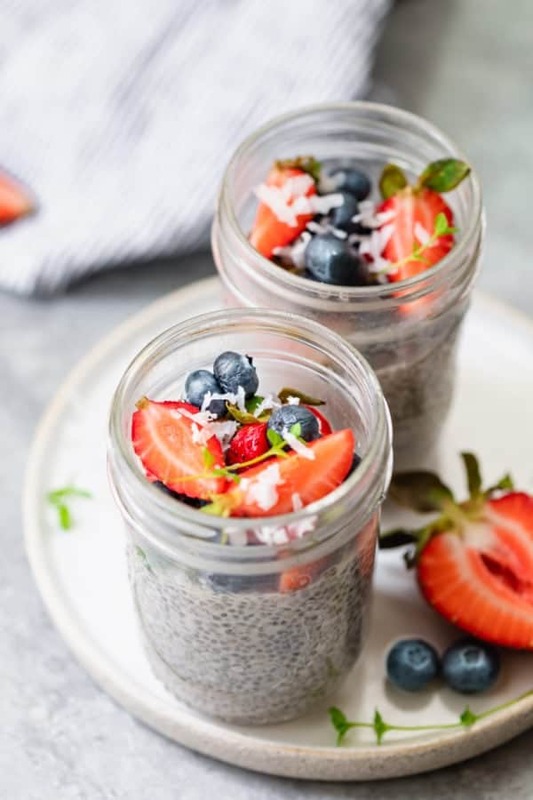 Recipe looks delicious and cant wait to try it!! Yes, you can just substitute 2 teaspoons curry powder along with 3 oz of tomato paste for the color. Hope you like it! What can you substitute if you can’t get Garam masala!? You can leave it out all together or try this substitute a combination of Coriander, Cumin, Black Peppercorns, Cardamom, Cloves and Nutmeg. Hope that helps! That’s so awesome! Thank you!!! I love butter chicken! I’ll have to try your recipe!